Asaf Avidan’s new album “Different Pulses”, Israel’s answer to Jimmy Scott. 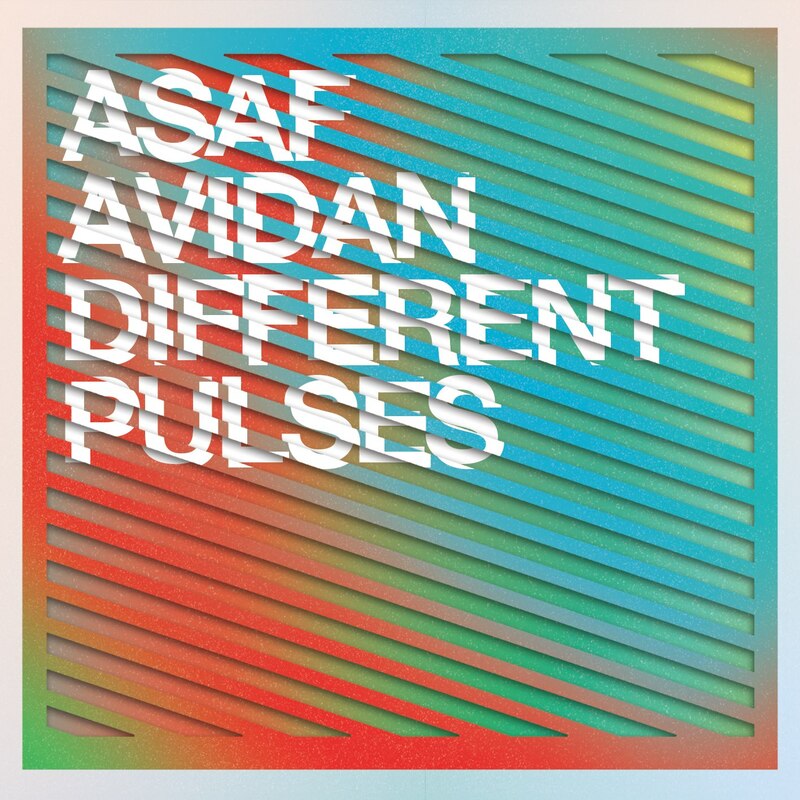 When Bob Boilen played the title track from Asaf Avidan’s 2012 album Different Pulses on NPR’s All Songs Considered (reviewed earlier here) a few weeks ago, you could hear the sound of various jaws hitting the floor. That’s because the voice of this latter day Janis Joplin belongs in fact to a 33 year old Israeli man. Unlike poor old Jimmy Scott though, there’s nothing unfortunate about the sound that he produces. It’s just very unusual. Little Jimmy Scott, as he was dubbed, was born with Kallmann’s Syndrome. This meant that he grew to be no taller than four foot eleven until he was into his late thirties, when he suddenly spouted another 8 inches. The result was that the diminutive Scott sounded for all the world like a female jazz singer. 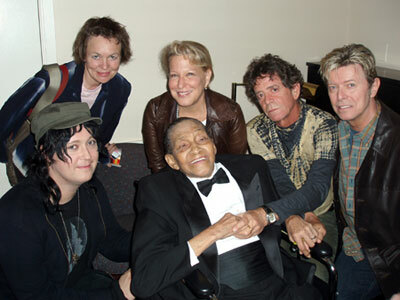 Little Jimmy Scott, with fans Lou Reed, Laurie Anderson, David Bowie and Antony Hegarty. And sure enough, he was right royally screwed by most of the people he seems to have met in the music industry throughout the 50s and 60s. Thoroughly dejected and unfairly ignored, he retired in the 70s. Happily though, he was rescued again in the 1990s by the archetypal outsiders Lou Reed and David Lynch, who provided him with a belated renaissance. Reed invited him to perform on his 1992 album Magic and Loss, which was dedicated to their mutual friend Doc Pomus. And Lynch brought him in to work on the second series of Twin Peaks, which you can hear here. Avidan in contrast seems to be a perfectly conventional man physically speaking. Which makes the sound he produces all the more remarkable. 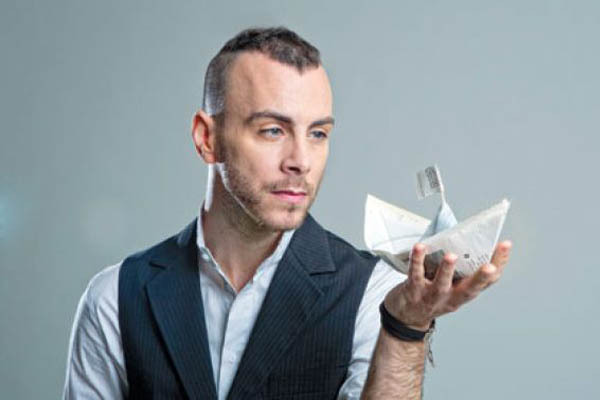 Avidan began touring his native Israel with his band in 2006, and over the next four or five years they produced 3 hugely successful albums, where they quickly amassed a sizable cult following. They went their separate ways in 2011 though, and Different Pulses is his debut solo album. If Jimmy Scott had had Janis Joplin’s oomph, and she his vocal range, this is what it might have sounded like. Impressively, it’s a range and emotional depth that’s maintained across the whole album. There’s very little sense however of the East or of the Orient. There is occasionally a slight hint of the few years Avidan spent on Jamaica soaking up their rhythms. But for the most part it’s a richly sophisticated RnB album that would 40 years ago have been put out by Stax and distributed by Atlantic Records. Doc Pomus would been called in to provide a lyric or two. And Jimmy Scott could easily have been smuggled in to provide backing vocals. Un-credited of course. You can see the video for Different Pulses and hear Avidan for yourself here. Sign up for a subscription right or below, and I shall keep you posted every week on All the Very Best and Worst in Film, Television and Music! “Women Without Men”, One More Must See Film from Iran. Women Without Men sounds like another of those worthy but dull, educational chores. Nothing could be further from the truth. It’s a sumptuous, richly evocative film that calls to mind the heady days of Italian cinema in the 60s and early 70s. Think late Visconti, De Sica’s The Garden of the Finzi Continis (reviewed earlier here) and the Taviani brothers. Imagine if Bertolucci had ever managed to use his technical bravura to actually say something. Shirin Neshat, whose first film this was, has said that she was influenced by Kiarostami when she decided to make the move from conceptual art into the world of feature films. And she is very much part of that new wave of Iranian film makers that also includes Ashgar Farhadi, whose A Separation and About Elly I reviewed here and here, and poor Jafar Panahi, reviewed here who, outrageously, remains imprisoned in Iran. 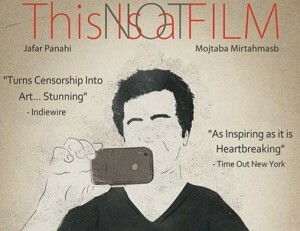 Panahi’s This Is Not A Film. Interestingly and unlike them, she is looking at Iran from the outside, having lived most of her life as an exile in the US. Neshat has taken Shahrnush Parisipur’s famous novella, which charts the lives of four women, and has posited their stories against the backdrop of the events of 1953. It was then that the British and the US came together to overthrow the democratically elected government of Mosaddegh, and supplant him with a military dictatorship under the Shah, so they could regain control of Iran’s oil supply. I can’t for the life of me imagine why a film maker would waste her time on historical events like this that clearly have so little relevance to the world we live in today. Inevitably, indeed necessarily, revolution followed 25 years later. And immediately after which, the same crowd armed and funded Iraq in its war against Iran. And then, more oil, more US and British troops, yet more resentment, and so on ad infinitum. And let’s not even get into the centuries of abuse in neighbouring Afghanistan. Little wonder then that Iran looks at the West with all too weary and jaundiced eyes. All of which could have resulted in a painfully dull film, part historical lecture, part feminist tract. But what Neshat has made instead is a marriage of magic realism and exquisite, formal precision. The result is ravishingly beautiful and quietly moving. Four female archetypes set against the backdrop of political turmoil, in the face of which, resistance appears futile. And yet, resist they must. We all should. It won the Silver Lion at Venice in 2009 – in fairness, the Golden Lion went to the brilliant Lebanon. You should see them both, and you can see the trailer for Women Without Men here. 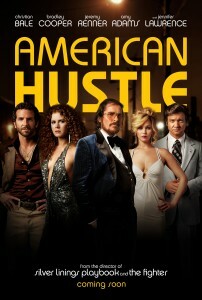 “American Hustle”: Goodfellas, Once More but With Feeling. American Hustle is so self-referential it goes past knowingness and back to sincerity, before going around for another half turn to end up staring at itself approvingly in the mirror. It’s post-parody. It’s 1978, Donna Summer discos, the men all John Travolta and the women wear dresses designed exclusively to demonstrate that they have absolutely nothing else on underneath. Christian Bale plays Robert De Niro who meets a character played, obviously, by De Niro, playing a character connected (see what I did there?) to one he’d previously played in the Godfather. And so on. If this were an academic paper, it would come in for criticism from the latest breed of French pseudo-intellectual, neo-Marxist, post-structural, deconstructionist literary giants on the grounds that it’s gratuitously post-modern, and far too clever by half. And, all too predictably, I loved it. Amy Adams; no strings attached. I can see why it’s been getting so many lukewarm reviews. If you haven’t spent quite so much of your time transfixed by the silver screen, if in short you have a life, then its charms might very easily pass you by. But for a select few the thought of a film maker being asked to re-make Goodfellas, only this time to do it like they were really, really in thrall to every conceivably aspect of America culture, and not just the music, films, clothes and mores, its very sound, will send shivers down your carefully constructed meta spine. 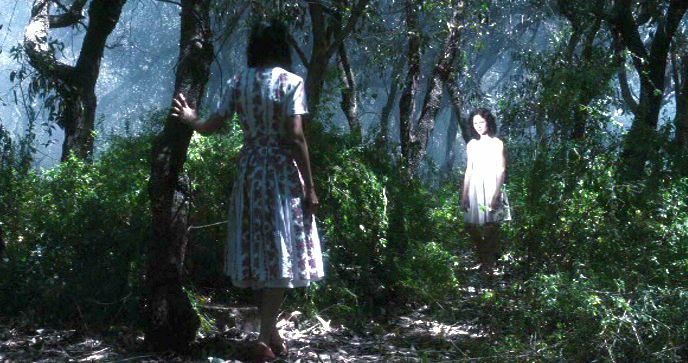 This is one of the most tactile films you’ll ever sink into. You can feel the hairspray, cheap nail varnish and the vinyl as it rotates beneath that unforgiving needle. And true to its college campus roots, your enjoyment is reflected and refracted through the visible pleasure that everyone involved on the screen is having at being up there entertaining you. This is David O Russell’s seventh film. His fourth, I Heart Huckabees is arguably the most unconventional and confrontational film made in modern Hollywood history. And yes I’m in the Orwellian minority of one with that film. I’m the one person that genuinely loved it. Well this is its exact corollary. The archetypal Hollywood film. And as such, it’s gloriously out there. But for heaven’s sake, see it in the cinema. “12 Years A Slave” is that Rare Thing, A Serious Film. 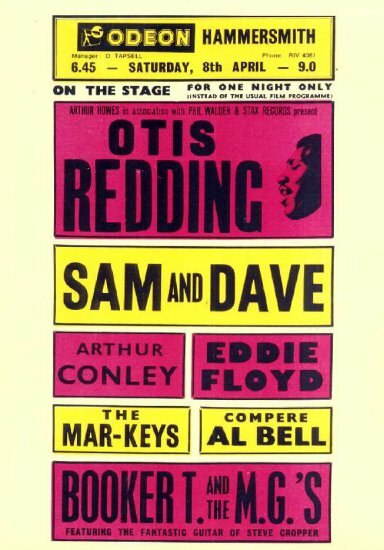 In 1967, the now legendary Stax Records sent its modest rostra of fledgling stars on a minor tour of Britain and France. It was a sensation. 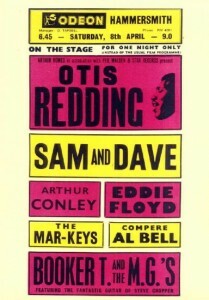 Otis Redding, Sam and Dave, Booker T and the MGs and co couldn’t believe it. Audiences in Britain were responding to them as if they were the Rolling Stones. Actually, most of the Stones were there in the audience, and they were as blown away by what they were hearing as everybody else. The legendary Stax Records Tour of 1967. But what really got them, was driving around England on the modest Tour bus that Stax had organized for them, they’d occasionally stop off at some sleepy town at the back end of beyond in rural England, get out the bus, and go into a shop! In the front door! And there, they’d be served their stale sandwiches and fizzy pop, as if this was the most normal thing in the world. That was 1967. Less the 50 years ago. No wonder Obama took that selfie at Mandela’s funeral. Even he must occasional have to pinch himself. Imagine, barely a generation after that, there’s a black man in the White house. The book that it was based on. Slavery is to race what Hiroshima is to the atomic bomb. It’s its necessary consequence. And together with Hiroshima and the Holocaust, slavery is one of the three colossal, unfathomable questions marks that punctuate modern history. Any film that tries to tackle it has a hundred and one ways of getting it horribly wrong. Look at Schindler’s List. By focusing on the one good Nazi, Spielberg was able to cloak the holocaust with a beginning, middle and end, and thereby turn in into A N Other Hollywood film. Which is unforgivable. 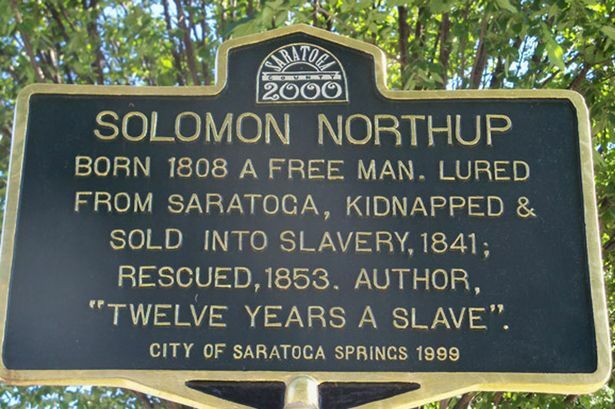 Remarkably, 12 Years A Slave gets everything absolutely right. It’s helped by the nature of its story. Solomon is an educated, affluent, artistic man living a privileged life. He is in other words what we all aspire to be. 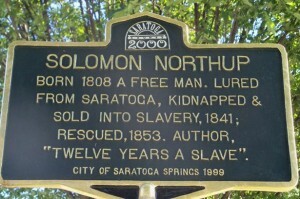 So when he’s kidnapped and sold into slavery, our sympathy for him is immediate. If on the other hand you were to tell a story of someone who was already a slave, there’s the danger of seeing them, however unintentionally, as the Other. As one of them. Can anyone imagine Spartacus playing the violin in evening wear? By beginning in this way, you necessarily feel for him and his predicament in a way that you mightn’t have done had they approached the topic in a different way. The fact that he is a classically trained musician could have encouraged the film makers to drape their film in reams of music. Their decision to use music but sparsely throughout is again exactly the right one. As ever, less is more. 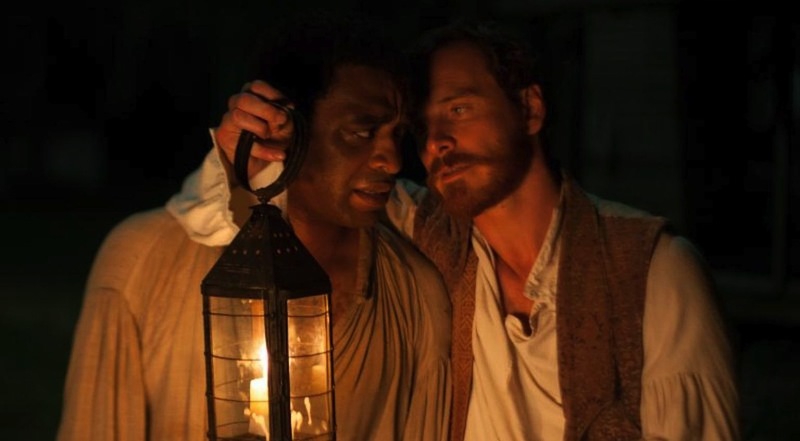 Fassbinder and Ejiofor in 12 Years A Slave. But at the heart of the film are the central performances. Chiwetel Ejiofor has been hovering on the fringes of stardom for some time now – he was particularly memorable in Joss Whedon’s criminally overlooked Serenity, see here . That will obviously change now. And Michael Fassbinder confirms, again, why he is one of the hottest properties anywhere in the world. And as for director Steve McQueen. As intriguing as his first couple of film, Hunger (’08) and Shame (’11) were, this is a completely different calibre of film. 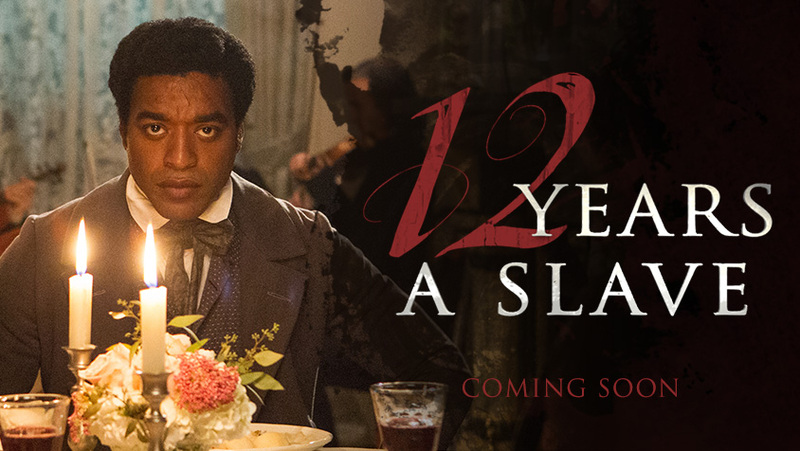 12 Years A Slave is that rare thing; moving, profound and serious. You can see they trailer here. 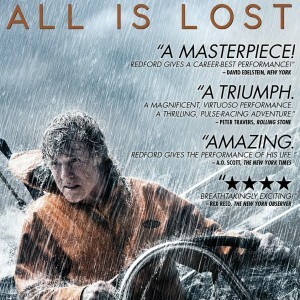 All Is Lost, Robert Redford as the Surprisingly Young Looking Considering His Age Man and The Sea. The first thing all actors do whenever they arrive for their first day on set is to mark off all the scenes that has their character in. Then they take all of the rest of the pages of the script and throw them into the nearest bin. After all, what possible use could they have for them? 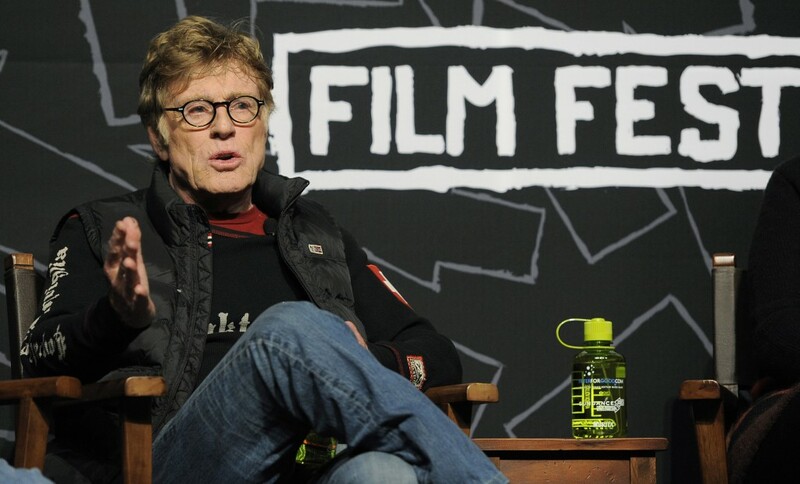 So it’s not that hard to see why Hollywood legend Robert Redford might have agreed to play the lead in All Is Lost, the second feature from rookie film maker J. C. Chandor. Here’s a film with literally just one character. Not only is he guaranteed to be in every scene, he’s gong to end up in practically every frame. The last time Robert Redford acted in anything remotely interesting was Indecent Proposal some 20 years ago in 1993, which was at least a good idea for a film. Since then, his performances in the likes of The Horse Whisperer (’98), The Last Castle (’01) and Lions For Lambs (’07), and the fact that he agreed to be in them in the first place all confirm that acting per se has long since ceased to be of serious interest to him. Redford directed the excellent Quiz Show in ’94. The omens then for All Is Lost were not good. So it was a very pleasant surprise to find myself perched on the edge of my seat for almost each and every one of its 106 minutes. And whilst it mightn’t be Hemingway, it’s an impressively crafted and well-wrought drama not a million miles from what the young Stephen Spielberg was doing in his made for TV feature Duel in 1971. Redford plays a soon to be middle-aged man – he’s even begun to go grey around the temples – who’s stranded on a tiny boat in the middle of the Indian Ocean. Sure there are one or two moments when the spell is broken. Would he really have stood there stitching his forehead as the boat he stood in sank beneath his feet? And would he really have managed to hold on to his reading glasses throughout the whole ordeal? Reading glasses, another sign of course that he’ll soon be hitting his 40s, or at least his mid 30s. And when he goes out on deck to battle the raging storm that has been CGId behind him, it’s about as convincing as seeing one of those gangsters in a 40s film noir holding on to a comically bouncing steering wheel, as a film of the street he is supposed to be driving down is projected on to a shimmering curtain behind him. 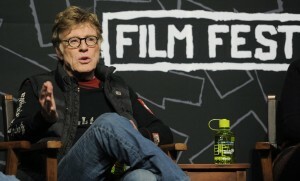 Redford set up the Sundance Film Festival in ’78, and met Chandor there when he screened his debut Margin Call (’11). But these are minor quibbles. For the most part, this is a surprisingly gripping film. And, remarkably, Redford gives a restrained and quietly monumental performance that stands up to any of his best work from the 70s. And as for Chandor, this is as impressive a Hollywood calling card as you’re likely to see. You can expect to see him on board the next multi-houred, entirely CGId and pointlessly 3Dd, fetid franchise, coming soon alas to a cinema near you. You can see the All Is Lost trailer here.